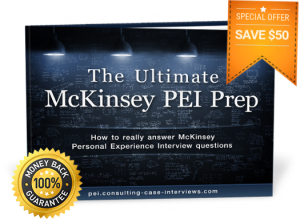 As an introduction, I recommend in general using the PARADE framework for structuring your McKinsey PEI, and talking about your impact usually goes into the “A” for “Anticipated consequence”. Since the “PAR” is just to give your interviewer a general understanding of the overall situation within 1-2 minutes (and since the core part of your evaluation is based on your specific “Actions” and “Decision-making rationale”), I am perfectly fine with summarizing your impact on a situation more or less in one sentence as a start. Consultant: What was the impact for you as a person? Please note that also the sequence was starting with “Client” since you will be operating in a highly client-centered service-oriented business. Below that structure, of course you can (and even should) structure it further into quantitative (at least in ballpark numbers) and qualitative aspects of your impact. Previous Previous post: What should I say about my motivation in the Entrepreneurial Drive McKinsey PEI dimension?